The Dragon Spirit was evolved from the evil dragon Neya who was sealed in the Shadow Knight's body. After a lengthy purification, it becomes a power source of the knight. The Dragon Spirit is permanently converged with the Shadow Knight (namely an associated Eudemon). 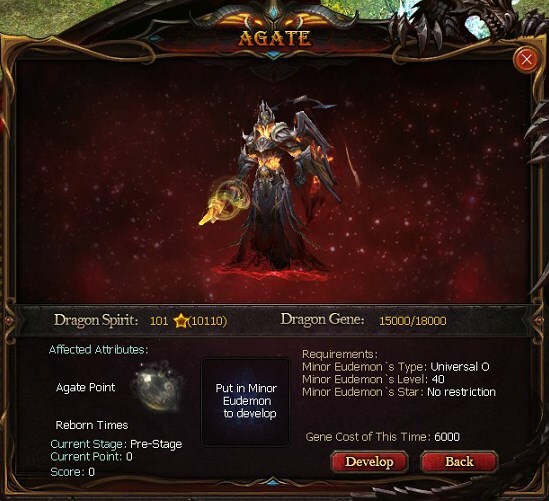 Through the Sacrifice, the knight can improve the Dragon Spirit's attributes and star level, and also achieve exclusive skills and special mounts. The Sacrifice, as the main method to strengthen the Dragon Spirits, provides 9 ways available, and 6 of them grant exclusive skills – the Dragon Skills . Choose the best way for your Dragon Spirit. In addition, the Defense of the Dragon Spirit can be shared with the character and other Eudemons. It will take the highest value of the P-Defense and M-Defense among the Dragon Spirit, the character, the summoned Eudemons and the converged Eudemon to share. Furthermore, the value can be counted together with the bonus Defense given by skills. Click on the icon above the item bar to access the Sacrifice interface. 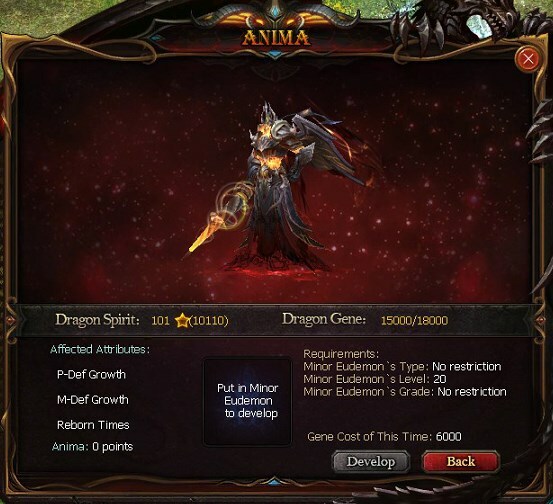 Earn 500 points of Anima to acquire the Dragon Skill, [Bloodthirsty]. To carry out the Anima Sacrifice, your character should be above Level 40. There are no limits on the type of the Minor Eudemon that can be used, which considerably reduces the cost. The Anima Sacrifice can enhance the P-Defense Growth and M-Defense Growth of the Dragon Spirit, and increase its Reborn Times by 1. 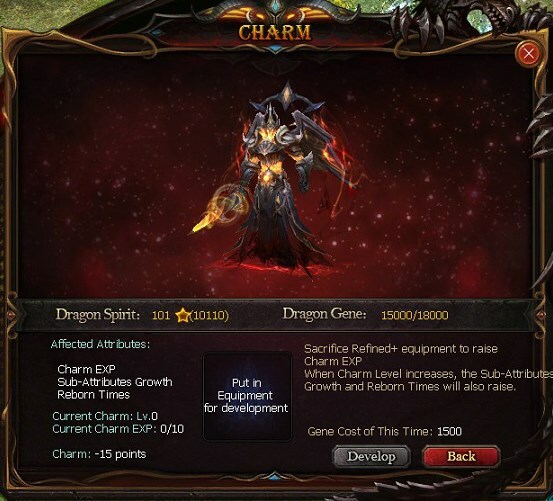 Earn 100 points of Charm to acquire the Dragon Skill, [Tenacity]. The Origin Sacrifice defaults to be activated. Without the need to sacrifice any Minor Eudemons, it randomly improves one of the Initial Attributes and increases the Reborn Times by 1. Generally, it takes 1 hour to finish the sacrifice. The higher the grade of the Origin, the longer the sacrifice time. Each 30 minutes of character online time will speed up the sacrifice 5 times as fast as normal. 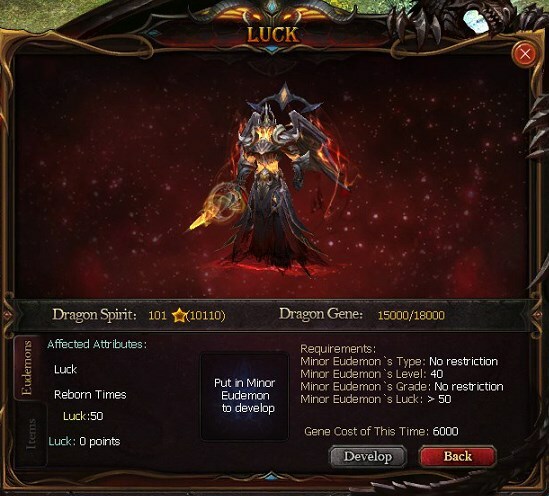 Earn 60 points of Luck to acquire the Dragon Skill [Immortal]. The Luck Sacrifice can only be performed by Level 70+ Shadow Knights. After the sacrifice, the Luck and Reborn Times of the Dragon Spirit will increase. The Minor Eudemon's Luck should be higher than that of the Dragon Spirit. If the Luck is between 70-110, use a Violet Stone / Super Violet Stone to sacrifice; if between 110-120, use a Super Violet Stone; if above 120, use a bottle of Luck Potion. 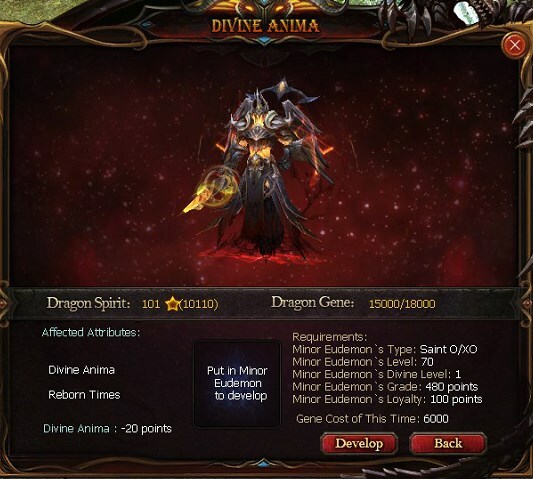 Earn 100 points of Divine Anima to acquire the Dragon Skill, [Breakthrough]. When the Dragon Spirit's Divine Level reaches 1, the knight can unlock the Divine Anima Sacrifice to improve the Dragon Spirit`s Anima. The Minor Eudemon must be a Saint XO or a Saint O. 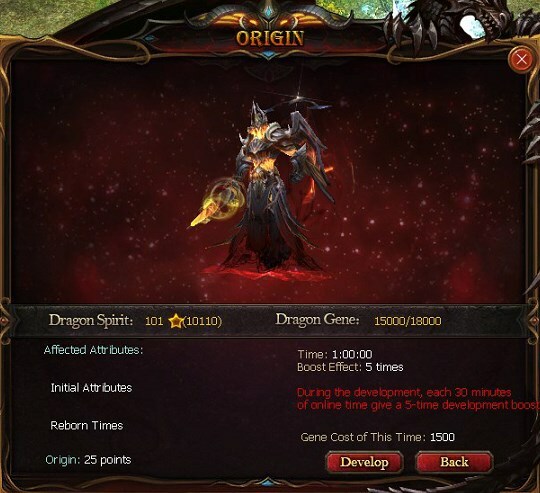 Earn 100 points of Divine Charm to acquire the Dragon Skill, [War Cry]. 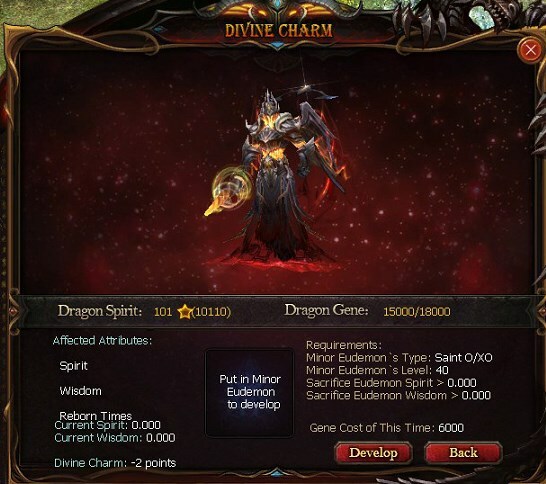 The Divine Charm Sacrifice will be available when the Dragon Spirit reaches Divine Level 1. Through the sacrifice, the Dragon Spirit`s Spirit and Wisdom will be promoted. The Minor Eudemon should be a Level 70+ Saint O/XO, whose Spirit and Wisdom are higher than those of the Dragon Spirit. 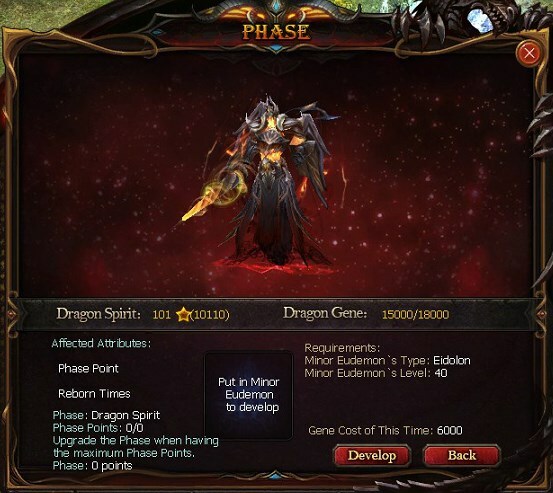 Perform the Phase Sacrifice to gain more Phase Points for the Dragon Spirit. When the Phase Points reach the maximum amount, the Phase will get upgraded. 4. It costs 6,000 Dragon Genes. When the Dragon Spirit got reborn 5 times, the knight receives a chance to carry out an Orb Sacrifice to increase the Dragon Spirit`s ORB (It maybe fail.). The sacrifice requires a Universal O/XO as the Minor Eudemon, each time. 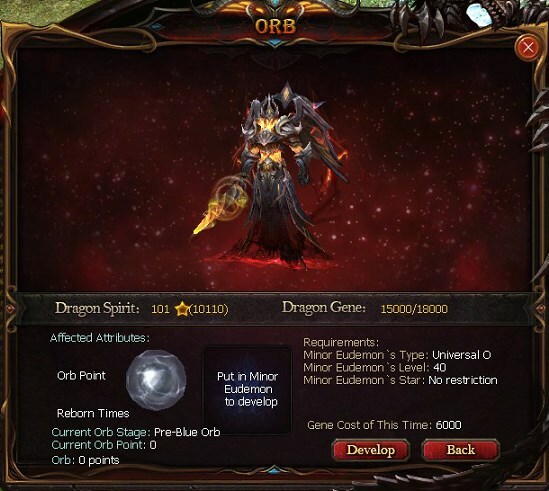 Please note that, if the sacrifice fails, the Dragon Spirit will lose a certain amount of ORB Point, but its ORB level will not be degraded. When the Dragon Spirit reaches 30-Star, the knight can carry out the Agate Sacrifice to improve the Agate by chance (It maybe fail.). A Universal O/XO is needed for the sacrifice, each time. Same as the Orb Sacrifice, its success rate is not 100%. If it fails, the Agate value will decrease, but its level will not be degraded.